Full Face Protection – THE ONLY SITE IN DEVON to use V Force Shield Wide Vision Anti Fog Goggles – A vital piece of equipment and so are provided at no extra cost. New Anti Fog Goggles, Far superior to your average site goggle! Special adaptive lense, Mist Free System, with wide field vision lense, standard with all our goggles, as well as larger goggles for people with glasses. Goggle cleaning equipment all included. Padded Camouflage – two-piece overalls with hoods are available to all our players. These help reduce the impact when hit. These suits are also very well camouflaged for the surrounding area and can make you almost blend into the background. Large Overalls also available. 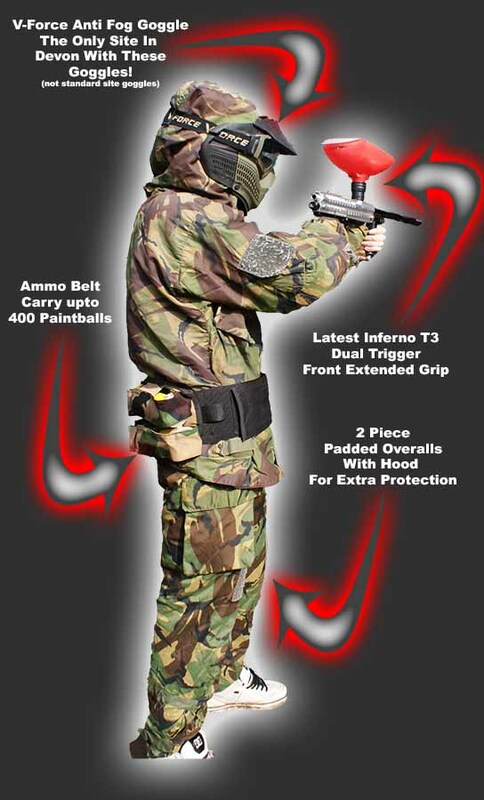 Upgrade Guns – THE ONLY SITE IN DEVON to have a massive stock of Tippmann X7 Paintball Markers. Super accurate and rapid fire unto 18 balls per second! These guns are the best on the market costing over £300 per gun. We can upgrade your whole team or just individuals.